An increasing body of academic and third-party research has shown that online consumer behavior is a good, albeit not perfect, proxy for how consumers behave offline. This means that organizations of all sizes, whether a small business on Main Street or a Fortune 50 giant, can get meaningful and actionable intelligence into their consumer target, industry trends and competitors across the consumer purchase journey rather than viewing them in silos. The best part? This consumer and competitor data can often be free if you know where to look and are willing to make some sacrifices around quality of data and ability to customize. Following is a list of my favorite free tools for mining purchase and online behavior to analyze for its potential impact on your organization. One of the most powerful data sources out there for actual consumer purchases, InfoScout provides free data on thousands of CPG brands and retailers based on a panel of 200,000+ real consumers. Infoscout is a gold mine to learn when, where, how and what consumers are purchasing, as well as what else is sharing the basket. My personal favorite is the loyalty meter showing what a consumer would do if the store was out of the branded product they wanted. Social listening and analytics have truly emerged from a nice to have tool into an essential because of the far-reaching implications it can have on an enlightened organization. Marketing, customer care, innovation and even legal compliance are all business units that can benefit from closely watching social trends and engagement. There are many tools out there, but the best free generalist tool (versus specializing in one channel) is Social Mention. Consumer search behavior can have such a profound impact on an organization’s content and targeting strategy. If consumers are searching for information related to your brand or product, that means they are at a high point of consideration and searching for answers to help them convert. Google Trends stands alone in its ability to show you what consumers are searching for, related searches and the increase over a set period and even the regions searching most. Often overlooked or misunderstood, analyzing website behavior is incredibly useful to learn what sites are driving people to the site, what search words they’re using, the interests of site visitors and what site they go to next. SimilarWeb is my favorite free tool (although we also have a paid subscription) because of the depth and accuracy. I find this most useful when researching competitors and media sites to learn what their visitors are seeking and how we might intercept them. 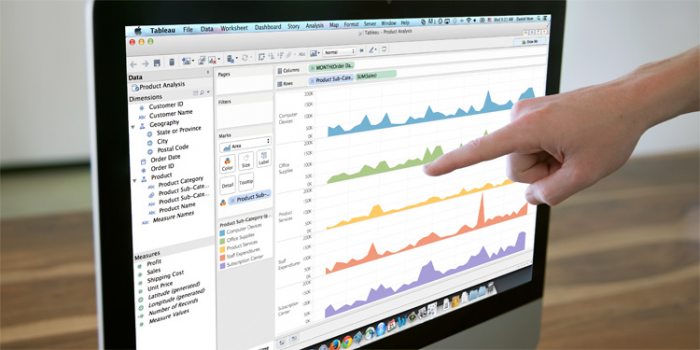 The free version of Tableau does an outstanding job of increasing the sophistication and options of your data outputs, specifically charts, tables and graphs beyond what Excel and PowerPoint are capable of displaying. You lose a significant amount of flexibility with customizing your data and the amount of data you can analyze or display with the free package, but the price is right. Total cost to an organization for good intelligence on the consumer, marketplace and even your competitors’ customers using the above tools? Zero. I’d also recommend these as a starting point if you’re looking to invest in paid tools; having some experience with what data is most useful to you and understanding the power and limitations of these tools will leave you a more informed buyer. Have any others we should know about? Please leave them in the comments and happy hunting!